For those who like fun and excitement there is the first and only bobsleigh track in Prague’s Prosek. Although it is located right on the edge of the city, it is easily reachable by public transport. The bobsleigh (Bobova Dráha in Czech) makes for a great trip for a number of reasons. The bobsleigh goes at the speed of your choice, however, many daring enthusiasts come here to hurtle at amazing speeds to experience some adventure and release some adrenaline. Opened in the summer of 2003 on a beautiful hilly area high above the city, the bobsleigh runs upon the tract of impressive 1,000 metres and it is possible to reach scary speeds of more than 60 km per hour, once you become fearless riding it. 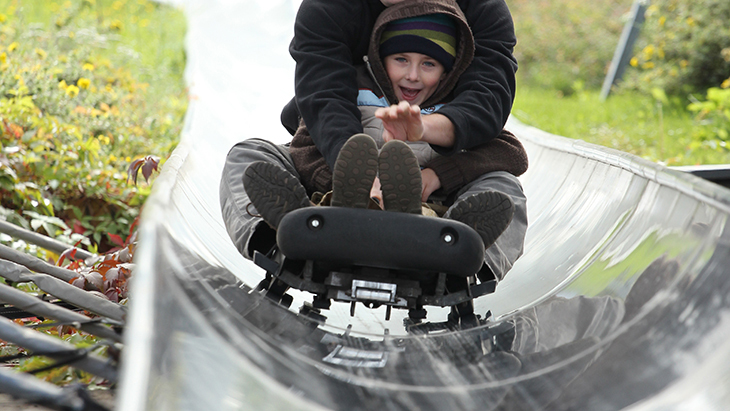 The bobsleigh can also be ridden by two people, and it is possible to use the very effective brake to take the corners and the entire ride at your own speed. Children aged eight and above are allowed to ride the bobsleigh alone, but those younger must have an adult alongside them. The track is no plain, downhill, curving spin, it offers a number of curves and bumps that require your top concentration. There is a lift for you to take to the top. Thanks to the special night lights you can enjoy the bobsleigh track in the evening time. Besides the bobsleigh track there is a great bar and restaurant and many outdoor dining areas and playing areas that make for a great family outing. Do not hesitate to use the convenient public transport (the metro station Prosek) to enjoy some beers at the bar and give the bobsleigh track a try. Opened daily from 10 a.m. till 22 p.m.
For more information visit: www.bobovadraha.cz.